The Westone Am Pro 30 is a brand new model that is actually not yet available, but soon will be within the next month or so. Westone makes some excellent IEM's and have been included in our annual shootout in years past. They jumped at the opportunity to be reviewed, but they did not have a final product with packaging, so a final engineering sample was provided with no packaging. They did promise that the engineering sample provided will sound just the same as the final retail product, but look a tad different than the final product that ships. Although comparing what was provided to the look in the photo on Westone's website product page, the look is really close! So when you see our photos, the final product will look just a tad different, if you look really closely. I had to study it for a few minutes to find the extremely small difference. They looked like a final product to me! And a good value at MSRP of $439. · • Westone True-Fit Technology: 50+ years experience with in-ear applications has yielded a low-profile, lightweight, universal earpiece which delivers maximum comfort and in-ear coupling for dynamic transfer of sound. · • Balanced Aramture Driver: Westone’s balanced armature drivers are significantly more compact and efficient than traditional dynamic drivers. By combining multiple balanced armature drivers with sophisticated crossover networks, Westone monitors provide enhanced sonic detail and frequency range that extends well beyond typical in-ear solutions. · • MMCX Audio™ Connecter: Designed specifically for musicians’ monitors, our audio connector ensures a reliable connection every time. · • Patent Pending SLED™ Technology: Combines your ambient surroundings with your monitor signal with no compromise to the frequency response. · • TRU™ Audio Filter: Allows you to fully experience your performance—hear your band, your fans, and everything else. · • Designed & Assembled in the USA: Meticulously built by a staff of dedicated artisans and lab techs based in the USA, Westone’s products exhibit a level of craftsmanship that truly embodies America’s rich history of handmade artistry. Driver: Three balanced armature drivers with three-way crossover. The Westone Am Pro 30 came shipped in one of their water resistant hard cases for protection. Also included were some difference sized ear tips, and wax tool. Materials used in the construction was mostly plastic. Quality of materials used was very good, as was the fit and finish. It's the quality I have come to expect from Westone. And I liked the cables being detachable. Westone has for as long as I have been working with them, provided a stellar product. The Westone Am Pro 30 is designed around the professional musician performing on-stage, so there is no in-line mic or controls for your smartphone. And this is a product they are very excited about, so I couldn't wait to review them. So let's hear how they sound. David Bowie: Let's Dance, the bass had nice punch, plenty of depth, as well as good authority. Percussion was crisp and dynamic. The knocker sounded woody and natural, with large soundstage and very good imaging. Nice texture in vocals. Journey: Don't Stop Believing, the keyboard sounded very natural, vocals were smooth with lots of resolution and textures. Cymbals were crisp and very dynamic. Kick drum had nice low end extension. Also Sprach Zarathustra, had nice low end extension that played deep with authority. Brass was very smooth without being too brassy. Very good dynamics and resolution in the tympani. Junior Wells: Why are People Like That, revealed nice sounding vocals with depth and harmonics. Bass guitar played deep and with some authority, harmonica so dynamic it sounded like I was right there, and the percussion was crisp. Gershwin: Rhapsody in Blue, the clarinet had excellent tone, with resolution good enough you could hear the woodiness and the breathing technique. Piano sounded very natural. They threw a big soundstage, and imaging was excellent. Percussion was crisp and clean. Brass was very smooth and dynamic without being overly brassy. Bassoon had nice texture. The sound in all was extremely neutral, with lots of resolution, and good bass depth and authority. The level of detail, imaging, and soundstage are exceptional, which I have also learned is signature Westone. And the SLED Technology worked! I liked their SLED technology, which allowed you to somewhat hear what is going on around you, and that feature could make it perfect for you. For musicians on a tight budget...this is for you! I'm not sure that they helped give a bigger soundstage the way open back over the ear headphones typically sound. But it was pretty cool being able to hear some of what is going on around you, in your environment. 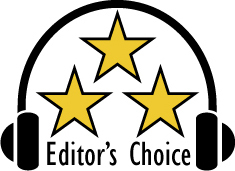 Based on their design, features, quality, and performance, the Westone Am Pro 30 has earned our Editor's Choice Award. For more info and complete specs, check out their website at www.westone.com.